Supporters who want legalized recreational marijuana for adults included in the state budget rallied at the State Capitol to try to convince lawmakers to move faster on the issue. 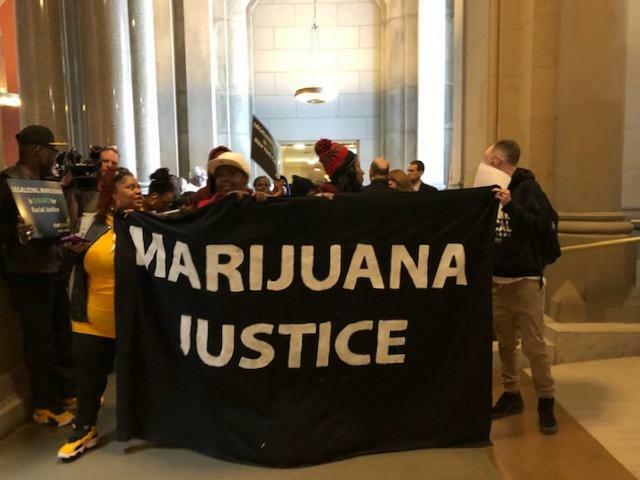 About 200 advocates from the Drug Policy Alliance, VOCAL-NY and other groups held a boisterous rally, at one point blocking off entrances to the Assembly and Senate chambers. Stanley Fritz of Citizen Action, who spoke at a rally one day earlier, said it’s a matter of justice for communities adversely affected by the cannabis prohibition. “We have a silly war on drugs that has disproportionately harmed black and brown people,” Fritz said. Kelly Cardinuto with the group Smart Approaches to Marijuana, which was begun by former Rep. Patrick Kennedy, said the protesters will not see social justice if the drug is legalized. She said they will instead see tactics by the major manufacturers, similar to Big Tobacco, to target adults and teens. She said about 5 to 10 percent of marijuana users become addicted, around the same percentage as those who use alcohol. Gov. Andrew Cuomo and legislative leaders say it’s still possible that legal marijuana could be part of the state budget. The spending plan is due March 31.